The next phase for Santos Basin appraisal and development will require new seismic data that captures the pre-salt accurately. Top: Location of the XArray Triple Source project which will cover the Aram, Carcará and Uirapuru areas. Bottom: Map showing fields and location of newly awarded acreage (Uirapuru) and the Aram, Bumerangue and Sul de Lula prospects that will be offered in the sixth Pre-Salt Round. In recent years, the geophysical, commercial and HSE benefits of multiple source acquisition, and the multiazimuth uplift in pre-salt illumination and velocity model building have become renowned within the industry. Utilizing this combined multi-source and multi-azimuth approach offers a safe, cost-effective and technically robust solution to further optimize the exploration of the Santos Basin. Formation tests over the Sagitario pre-salt prospect (below) in 2014 confirmed that the region had excellent carbonate reservoirs bearing high quality oil at a depth of 6,144m. 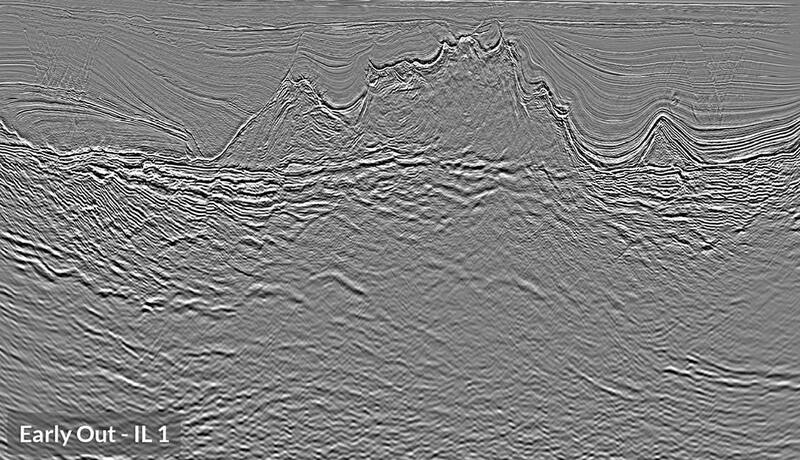 Polarcus has received a full environmental permit from IBAMA for an XArray™ Triple Source, long-offset project in the Santos Basin, which is designed to provide exceptional operational efficiency without compromising the pre-salt imaging. The permit for the ACU survey covers the Aram prospect, the unitized BM-S-8 and North of Carcará blocks, and the newly awarded Uirapuru block, as shown on the map. Further information can be provided on request. Seismic section over the Sagitario light oil discovery, portraying the detailed BM-S-50’s velocity model. Isotropic and anisotropic tomography was applied in both the post- and pre-salt sequences. The comprehensive processing workflow captured complex lateral velocity contrasts in post-salt mini-basins that register fast carbonate layers. The resulting imaging correctly depicts the salt geometries, the base of salt, and most importantly, the pre-salt sequence. Combining forces in the Santos pre-salt: a multi-azimuth and multi-source approach brings benefits to understanding pre-salt Brazil. Despite political uncertainty following October’s presidential election, the Brazilian regulatory body (ANP) remains committed to developing a re-energized oil and gas industry, proactively encouraging more foreign investment and synergies between international and local oil players. The results are significant. In the past nine months, the ANP has hosted five successful bid rounds that generated up to $5.45 billion in signature bonuses for the Brazilian government. Most recently, the ANP hosted the fourth Pre-Salt Round in June, approved blocks for the fifth round and designed the licensing calendar all the way to 2021. The attractive terms that are now offered to the industry, the volumes in place and the visibility and transparency of the entire licensing process makes offshore Brazil a prime location for hydrocarbon exploration. Not surprisingly, the supermajors have doubled their efforts to acquire new blocks and enter into new agreements with Petrobras to gain access to already discovered resources, such as Equinor’s 25% stake in the Roncador field, the largest producing field in Brazil with 210 Mbpd output. Zooming in to the Santos Basin, three companies stand out from the crowd: Equinor, ExxonMobil and Galp. The trio submitted the winning bid for the Uirapuru block during the 4th Pre-Salt Round, beating the Petrobras-led JV (with Total and BP) and two other consortiums. Petrobras did exercise its preferential right to enter the block and will be the operator with a 30% stake, while Exxon and Equinor will keep 28% each and Galp the remaining 14%. Just south-west of Uirapuru, the trio also holds very valuable pre-salt acreage in the North of Carcará and BM-S-8 blocks with a 40-40-20 split respectively. In late July, Upstream reported that the results of the pre-salt Guanxuma prospect drilled in BM-S-8 are promising, according to Equinor CFO, Hans Jakob Hegge. But although vintage seismic data might be enough to drill exploration wells, the next phase for the Santos appraisal and development will require new seismic data that captures the pre-salt accurately. 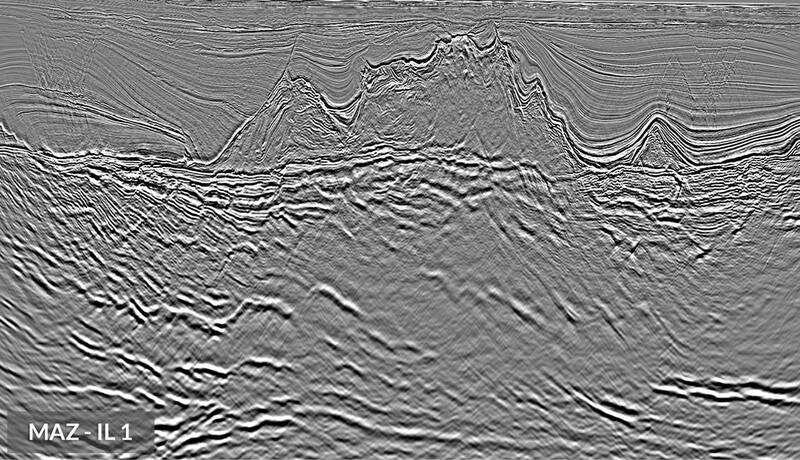 The geophysical challenge in the Santos Basin, as in any other pre-salt province, is to come up with a cost-effective solution that optimizes the illumination of the prolific pre-salt targets, accurately positions the main events correctly in depth while also respecting their continuity and character, and that captures the complexity of lateral velocity contrasts in the post-salt. Many seismic acquisition technologies have been developed to address these challenges, from Multi-Azimuth (MAZ) to Wide-Azimuth (WAZ), and going all the way to Full-Azimuth (FAZ) surveys. These techniques are considerably more expensive than conventional acquisition due to the increase in vessel time required for multi-azimuth solutions and the use of additional source vessels for wide-azimuth projects. The ultimate FAZ solution might come from the use of ocean bottom seismic, but that is considerably more expensive and time-consuming. Thus, the use of these techniques for exploration surveys has been limited to date. Comparison between new data migrated using a 2012 legacy regional velocity single azimuth (Early Out) model and using the velocity model derived from the 2017 MAZ survey. Data source: Polarcus. 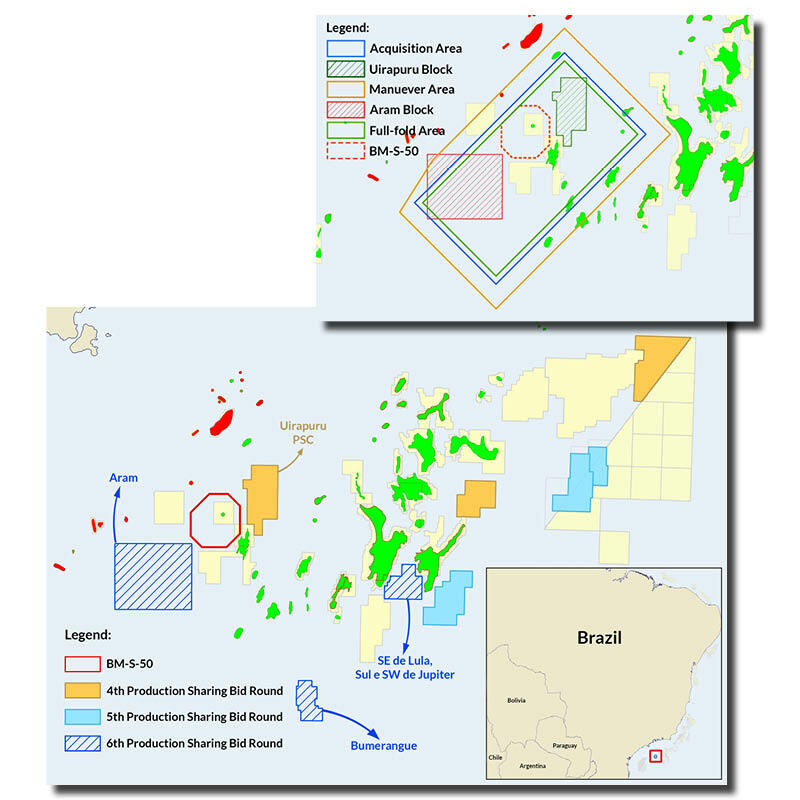 The 1,600 km2 BM-S-50 MAZ survey acquired for the Petrobras-led consortium, in which Shell and Repsol-Sinopec each individually hold a 20% stake, was designed to better delineate the 2014 Sagitario oil discovery and to assess the hydrocarbon potential of the surrounding area. The survey was shot in late 2016 through to early 2017, using a 12 x 75 x 8,100m streamer configuration. Azimuths of 45° and 135° were selected after a thorough illumination study indicated that these were the optimal acquisition directions to obtain complementary illumination of the pre-salt sequence. Explorationists with extensive knowledge of the area have indicated that the vintage datasets acquired east-west and northsouth have been found to either be suitable for mapping the complex faulting of the pre-salt, or for tracking the main horizon events, but never for both. The images here illustrate the uplift in illumination and accuracy of the velocity modeling gained from the use of two azimuths over the BM-S-50 survey. The comparisons are made between the new data depth-migrated using a 2012 legacy regional velocity model (Early Out) derived from a single azimuth, short-offset survey, and the new data migrated using the velocity model derived from the 2017 MAZ acquisition and processing. As demonstrated on these pages, the pre-salt imaging improvements using the multi-azimuth approach are significant. In these figures, the MAZ processing results in much better imaging of the deep pre-salt section, an improvement in the Base of Salt (BoS) identification, and better depth positioning of the pre-salt sequence. The imaging uplifts noted can be attributed in large part to the complementary azimuths contributing to a more constrained tomography solution in velocity model building, as well as providing additional illumination of structurally complex features such as faults and salt overhangs. Comparison between Early Out and MAZ processing. The latter better delineates the structural complexity of an untested pre-salt prospect west of BM-S-50 block. Data source: Polarcus. From a New Ventures perspective, the BM-S-50 survey highlights further potential in the pre-salt prospectivity just west of the block, as illustrated in the data comparison above. 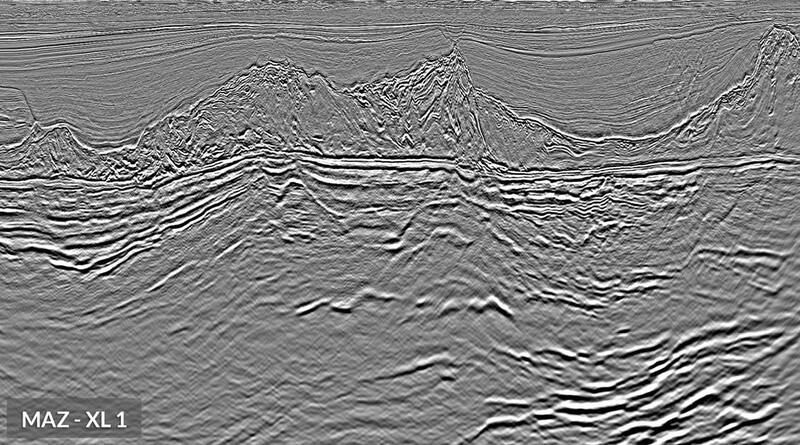 This new multi-azimuth dataset, which includes Kirchhoff, Beam and RTM volumes, provides an opportunity for some important basin insights to be extracted, enabling evaluation of the adjacent Aram prospect, which the ANP is planning to offer to the industry in the sixth Pre-Salt Round during the second half of 2019. 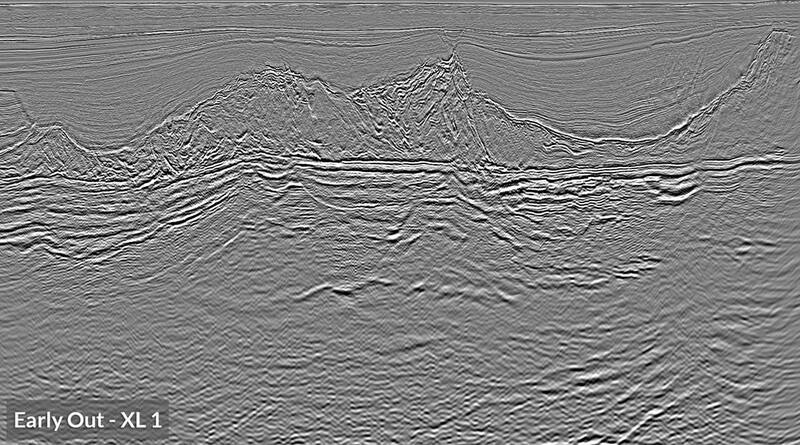 A further step-change in pre-salt imaging may be achieved by combining the high fold and dense cross-line sampling delivered by multiple source acquisition with the uplifts gained using the multi-azimuth acquisition technique, illustrated above. The velocity model resulting from such a survey will be even more robust in the post-salt sequence, and the pre-salt imaging will therefore have either the same or higher resolution than that of conventional dual source acquisition, depending on the operational efficiencies that are sought in the survey design stage. This geophysically and geologically driven approach offers a cost-effective solution for pre-salt exploration programs to oil and gas companies in the Santos, Campos and Espirito Santo Basins. A selection of GEO ExPro articles from Polarcus similar in content or related to hydrocarbon exploration in the South Atlantic Conjugate Margin. Polarcus brings clarity to the seismic imaging of the pre-salt geology in the Santos Basin. The Gambia: The Next Major Oil Play? The SNE and FAN discoveries in neighboring Senegal have opened up a new oil-prone fairway with multiple play types extending to the south into Gambian waters. With 12 recently announced deep-water discoveries and an aggressive leasing schedule for the Western and Central Gulf of Mexico, exploration and production technology is being pushed to its limits. Offshore Indonesia, TGS has recently come up with innovative ways of combining data from a number of sources to examine the prospectivity of underexplored deepwater frontier basins in a cost-effective manner.